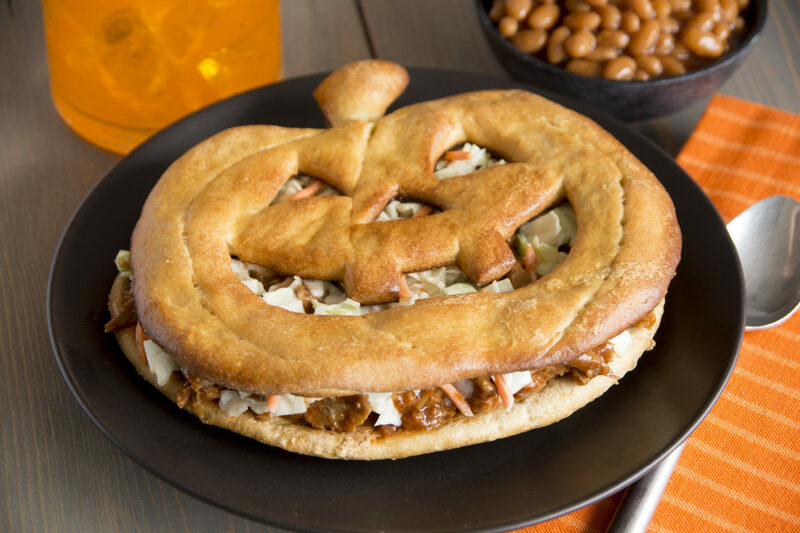 Who can resist an edible jack-o-lantern sandwich when it’s grinning at you? Press rolls together to form a flat oval shape. With a knife, cut out a wide shape in side of oval. Rotate about a quarter turn and tuck the point under the pumpkin to form a stem. Trim, if necessary. Place on a sprayed baking sheet. Cut out 3 large triangles for eyes and a nose, and a large crescent shape mouth. Leave some teeth in, if desired. Cut 3 curved lines from top to bottom, almost all the way through the dough. Brush with egg and let rise for 30 minutes. Bake at 350°F about 20 minutes or until golden brown. Let cool on rack and then slice horizontally. Fill with piping-hot barbecue beef topped with coleslaw, or your own favorite sandwich-makings.